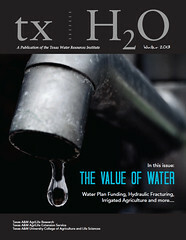 The value of water is spotlighted in the Winter 2013 issue of txH2O, the Texas Water Resources Institute’s magazine. Stories include an in-depth look at the costs of implementing the state water plan versus the consequences of doing nothing as well as a brief primer on water issues in the current Texas Legislature. Dr. Calvin Finch, director of the Water Conservation and Technology Center, compares water saving strategies in his recurring column, and another article covers the power generation industry’s use and consumption of water. Experts also discuss hydraulic fracturing and its water use, as well as potential new technologies to perfect the process. An article describing the major economic impacts that drought has had on lakes and tourism in Texas, a report examining the economic value of irrigated agriculture, and a feature on the Lone Star Healthy Streams program round out the issue.